If you've followed my blog for a while, you know I'm a huge fan of Wendy Mass (see this post and this one). But I never read Jeremy Fink until this summer. Source: purchased from The Big Blue Marble Bookstore, an indie bookstore in Philadelphia, on a trip to visit my friend Mariga, who works there. Synopsis (back cover copy and Indiebound): Jeremy Fink is about to turn thirteen. He collects mutant candy, he won't venture more than four blocks from his apartment if he can help it, and he definitely doesn't like surprises. On the other hand, his best friend, Lizzy, isn't afraid of anything, even if that might get her into trouble now and then. When a mysterious box arrives for Jeremy with the words The Meaning of Life engraved on the lid, Jeremy and Lizzy can't wait to find out what's inside. But the box is locked, so they set off an on adventure around Manhattan to find the keys to life's biggest mystery. My sweat smells like peanut butter. The almost-teen boy voice is fantastic. And I loved the dynamic between Jeremy and Lizzy. The adventure with the keys brings Jeremy out of his shell, so there's plenty of character growth. And the ending was not at all what I expected. 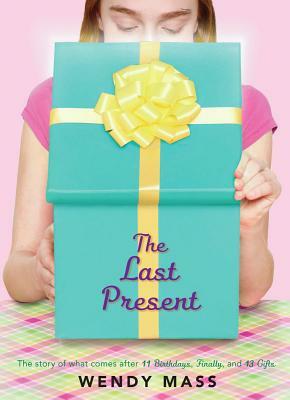 I'm excited that Wendy Mass has a new book coming in September, The Last Present, set in the Willow Falls universe of 11 Birthdays, Finally, and 13 Gifts. Leo and Amanda get to travel through time! Can't wait. Release date: September 24, 2013. For other MMGM links, visit Shannon's blog. 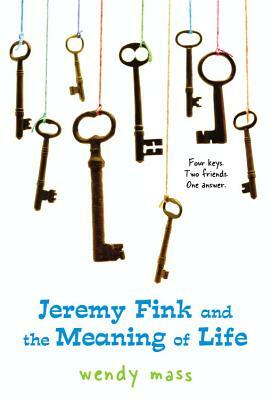 If you read Jeremy Fink, what did you think of it? And what books are you looking forward to in September? I love Wendy Mass! How did I miss Jeremy Fink? Right! I know. I felt the same way, Sue. I'd read just about every one of her books except Mango-Shaped Space and this one. Now I need to read Mango-Shaped Space. I haven't read anything by Wendy Mass, but this sounds really good. Thanks for letting us know about it. Hope you add it to your TBR list, Natalie (although I know it's a mile long). Oh, yes! Especially if you love peanut butter. I haven't read Jeremy Fink, but I loved 11 Birthdays. I'll be looking for this one. I think 11 Birthdays is my absolute favorite of hers, but this is right up there. How come I've never heard of this book before? I'm adding it to my list right away. Okay, definitely going to look up Wendy Mass. This book sounds like it's in the tradition of Rebecca Stead's Liar and Spy. I did't know about Wendy Mass or this book. I've got some catching up to do. It sounds like a really good book, I'm going to see if it's at the library when I go down there today. Thanks for the info. Ah, Janet, yes you do have some catching up to do. Thanks for stopping by. I'd never even heard of this one, and it sounds great. Thanks for the recommendation! You're welcome, Myrna. All her books are fun. I never read Jeremy Fink, but I think you have me convinced I should. I am excited about Brandon's Mull's Spirit Animals: Wild Born. I have to admit that I am excited to read - The Boxcar Children Beginning: The Aldens of Fair Meadow Farm because when I was younger I was a HUGE fan of the boxcar Children. When I saw that this book about them before they were the boxcar Children - I knew I had to read it. I know it's not a September book, but have you read Navigating Early by Clare Vanderpool? It is one of the best books I read this year. Erik! Yes, I have read Navigating Early, and it was excellent. I also grew up loving the Boxcar Children. In fact, the first book was my favorite book in third grade. Hope you get a chance to read Jeremy Fink. I'm embarrassed to say I haven't read any Wendy Maas yet. But she's on my to-read list. Jeremy Fink sounds great. The next new book I'm looking forward to is From Norvelt to Nowhere by Jack Gantos. Oh yes, Jennifer! Since I finally read Dead End in Norvelt earlier this year, I'm also eager to read the sequel. And I hope someday you will read a Wendy Mass book and realize what you've been missing. I love the cover and description. I really want to read this. Yay! Hope you do, Medeia. It's a lot of fun. I really like the cover too, but the white blog background doesn't do it justice. My 9 year old is currently reading Wendy's fairytale retellings. This is huge for her. Until recently, she would only read Magic Tree House books. I had one book and my 13 year-old son gushed about it from when he read it a few years ago. That made my daughter want to read it. I think it was Sleeping Beauty. From Magic Tree House to Wendy Mass. I'd call that an excellent transition, Stina. Good for your daughter. I haven't read Wendy's Twice Upon a Time books yet, but they look like a lot of fun.